Major General James L. Moreland began his military career with the Texas Army National Guard when he enlisted in Company C, 142d Infantry Regiment, 36th Infantry Division, at Ballinger, Texas, in 1940. He entered federal service with the division as an infantry squad leader and attended officer candidate school. He was commissioned as a, second lieutenant on 5 November-1942 and assigned as platoon leader in Company L, 343d Infantry Regiment, 86th Infantry Division. He assumed command of The company as a first lieutenant in March of 1943. Promoted to captain in September 1943, he continued to command Company L until his release from active duty in 1946. 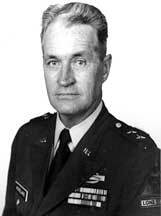 General Moreland again entered the Texas National Guard in 1949 ,as a major in the 36th Infantry Division. He was promoted to lieutenant colonel in 1959, then to colonel in 1962 and assigned as commander of the 2d Battle Group, 142d Infantry. When the pentomic concept was replaced in 1963, he reverted to lieutenant colonel until 1967, when he was again promoted to colonel and placed in command of the division's 2d Brigade. Following a major reorganization in 1968, General Moreland served as the deputy and then commander of the Arrowhead Emergency Operations Headquarters. He was next assigned as deputy of the 72d Separate Infantry Brigade (Mechanized) and in 1970 assumed command of the brigade. He was appointed brigadier general on 12 March 1971. He became commander of the 49th Armored Division when it was reactivated in 1973 and was promoted to major general on 8 February 1974. He commanded the division until his retirement on 31 October 1976. During his tenure, General Moreland was a member of the Reserve Forces Policy Board and was influential in the reinstating the Staff and Commander to Europe Program. He pioneered the use of the computerized logistics system called DLOGS in the Reserves when the 72d Brigade was chosen in 1971 as the National Guard's test base. He also helped pioneer the Round-out program, when the 72nd's 3d Battalion, 144th Infantry, was tasked to the 1st Cavalry Division, and the Capstone program, whereby the 49th Armored Division was aligned with the 2d Armored Division. Through his role as a member of the Reserve Forces Policy Board, he initiated a program of having Active Army units from the 2d Armored Division affiliate with units of the 49th Armored Division. The ingeniousness of General Moreland's plan was recognized when the program was adopted nationwide and resulted in the attaining the highest degree of readiness ever achieved by the ARNG. General Moreland's decorations and awards include the Distinguished Service Medal, the Bronze Star with oak leaf cluster, the Lone Star Distinguished Service Medal, the Combat Infantry Badge and many other federal and state awards. Major General Moreland, nicknamed "Gentleman Jim" by the members of his command, was highly respected by his soldiers, and their welfare was always foremost in his mind. He had the total courage of his convictions, which he expressed through his leadership and impeccable appearance. The distinguished accomplishments of General Moreland during his years of faithful service reflect great credit upon himself, the Texas Army National Guard and the United States of America.